Murphy is incredibly happy go lucky. Our Havamalt is playful and very affectionate. My husband and I have had him for 14 months and couldn't imagine life without him. He came to us from Illinois. He was 4.5 pounds when he arrived and is now almost 7 pounds. He is very smart and was potty trained quickly. He is spoiled with love and has lots of toys. He loves to go for walks. Everyone who meets him falls in love. He rarely barks but he is instantly alert to any strange sound. We are considering buying another one so Murphy has a pal. I would recommend the Havamalt to anyone who wants a non-shedding, hypoallergenic, small, affectionate and fun dog. We live in NY state so we bought him a snow suit for the winter so he can still go for walks. Murphy is such a cutie!! That face would melt anyone's heart. I love these Maltese mixes for that very reason. 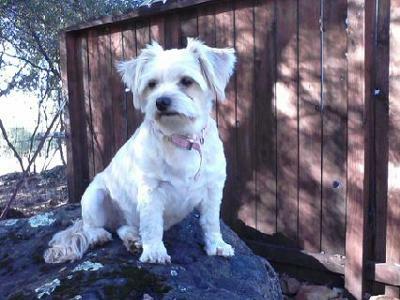 Muffit is a Morkie mostly white with a little gold here and there. We live in Utah and have cold, snowy winters, too. Muffit is just a year old and 7 lbs. Last winter we bought her a coat and boots. She loved the boots and ran all around in the snow having a ball. These breeds need to stay warm, but they do like their walks whether it's sunny or not, warm or cold. Join in and write your own page! It's easy to do. How? Simply click here to return to Tell Us About Your Havamalt!. I have a miracle dog. Kaci is a Havamalt. She is absolutely stunning. Gray with a white beard and rear skirt. She has a little heart shape in her skirt in the rear. She is older now but as cute as ever. She is my husband's dog. If I put a pic of my husband and her on the site, you will want to steal them both. I will try. She has the best and most feminine nature. Her story is amazing. About three years ago, Kaci was having trouble breathing and she cried (little yips) when she lost her breath. I took her in and they thought she has an intestinal growth pressing against her lungs. They took her into surgery on her scheduled day and discovered that she had a cancerous tumor growing on her aorta. No human nor animal has ever survived this. It is rare. Three vets worked on her for three hours. The aorta collapsed in their hands. They forged on. Dr. Douglas came out and told me she might not live and that they soon had to bring her out of anesthesia. But one more thing. She said that they could not get a pulse in one of her legs. She might have to amputate that leg. I was crazed. I said, "No, don't amputate. Let her come out of the anesthesia and give her a chance. On the table as soon as the anesthesia wore off, she sat up immediately. The vets were astonished. And her leg is fine today. They gave her many more years of life. Of course, I promised to go back to church if she lived. I failed miserably. But God keeps giving me chances always with dogs. She is my second miracle dog. I have never witnessed such a hardy, amazing animal. It shows that when an animal loves you and knows that you cannot give her up, how hard she will try to live. Should something ever happen to Kaci, she cannot ever be replaced but I would search the world to find a dog as wonderful as she is. My Havamalt is so friendly; he does not have a mean bone in his body. He is very playful, loves all other people and animals, and is generally just a joy to be around. He is so funny too. I also like that he rarely ever barks. He is a very quiet little dog. My only downside with him, is he isn't very bright sometimes. He was impossible to housebreak, but we finally got there, and he really likes to chew on stuff, and I can't break him of that either. He can't even jump. He can jump up enough to be petted, but he will not lift his back legs off the ground. My Havamalt also is afraid of different surfaces, like from the kitchen to living room it is carpet and tile. He won't cross into the living room from the kitchen without being picked up and vice versa. He is funny though, and my life is better with him, even with all of his oddities. My Muffit (Morkie) jumps as high as my waist (and I am 5'9" tall). And if your little dog doesn't like certain floors, that could be a sign of a problem, too. You should have your vet check her out--especially her hind end. Something could be wrong back there that prevents her from getting around like she should. Muffit slips and slides on tile floors, but it doesn't deter her from playing on them. Little dogs like these have delicate bones. Check it out to be on the safe side. These dogs are such a joy! Muffit barks at various and sundry things like strangers in the yard, the doorbell, getting excited. A can of marbles shaken when she does it has really curbed it. You are lucky that Dupree is quiet. I just got my Havamalt 4 days ago. She is 9 weeks. Our Havamalt Rose has already been trained to make on wee wee pad, come, stay. She is so lovable and so calm. I have always been so highly stressed. The moment I held her against my body and my stressed feelings have subsided. Its unbelievable, but true. I have owned other large dogs but they never given me the feeling that I have with our Havamalt Rose. The craziest is that I was never this kind of dog person and kinda laughed when I saw people acting this way with pets. My wife and I are in love with Rose. 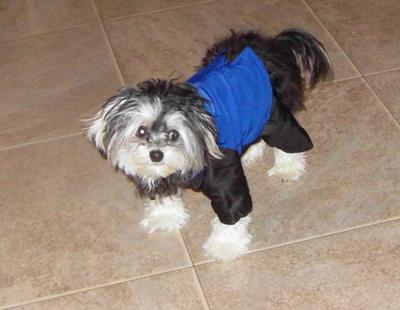 I was looking for a small dog and came across a "small dog breeder" a couple of hours away. I was told that she was a Maltese cross with ??? (some breed I had never heard of) It didn't matter because it was love at first sight. 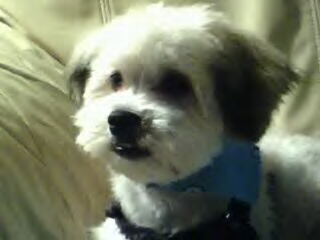 Recently, the dog groomer informed me little Justice was crossed with a Havanese. And I love the name "Havamalt", it makes me giggle. Chloe is 3 years old female Havamalt. 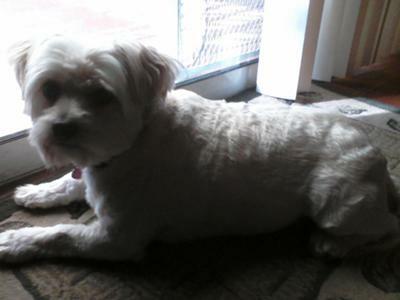 She is mixed with Maltese & Havanese. She is a big cuddle bug loves to be held 24 seven. My Havamalt follows me around everywhere. Loves to give kisses loves to play with toys. Loves to wear her outfits and loves to be under blankets. Pancho our Havamalt is an extremely intelligent dog. He is also very affectionate, following me into every room I go into. He is very playful and like to play after he goes for a walk. He belongs to my daughter and she is crazy about him. Whenever Pancho sees another dog, especially a small dog like him, he barks and tries to get close to the other dog. He tends to growl at bigger dogs but we've been trying to get him out of that habit. He gets along with his biological family, playing with his little sister whenever he sees her in Connecticut. He also has a best buddy in the Bronx, Peacan the Pug, and they play non stop whenever they are together. They usually play so much that they wear each other out. They chase each other and wrestle. My Havamalt Thor has the best personality you can find in a dog. He is obedient but likes to get his way at times. We call him our bed junkie; he will stay in bed the whole day if you let him. He gets along with all pets and its very playful without being rambunctious. My Havamalt likes to go for long walks, beach strolls and likes to chase his brother Tyr for miles at a time. He does not welcome clothes of any sort and hates to be brushed or put cologne on. I live just south of you. My Charley looks so much like your Thor. Aren't they just wonderful dogs????? 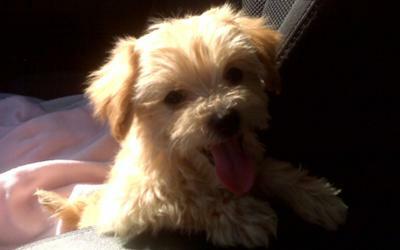 Charley was purchased at Petland in Bradenton. Matt is the store Mgr and a dear guy. We love Charley so much, we went back and got him another puppy to play with!!!! I pinned your Thor to my Pinterest!!!!! My Havamalt is one of the funniest dogs I have ever seen or owned. She is a little fur ball. She loves everyone and everything in the house. She is over a year old and still goes potty here and there in the house. She is really hard for us to train. But she is so worth it. So funny and bright. I work 3rd shift and she waits till I get home and sleeps with me all day. We also have Lucy the Shiz tzu who is loving and warm and cuddly, but Maggie has to always been kissing her or nibbling on her ears...very nice life for both of them. She has a great personality! My Havamalt Chloe is big love bug she loves to be by your side 24/7 she doesn't like it your not with her Chloe loves to be with people all day long she also doesn't when your out of her sight she a big snuggle bug loves to lick you she gets long great with other dogs. My Havamalt is so playful full of energy. 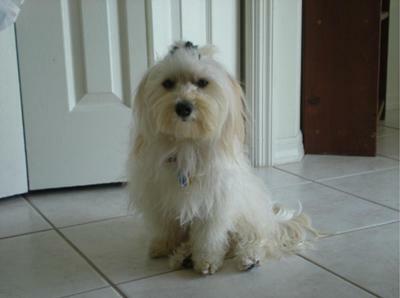 havamalts are 1/2 havanese and 1/2 maltese. I have both and love them dearly,they are going to have puppys in about 10 days. I haven't heard of a Havamalt. Obviously, part Maltese, but what's the other half? 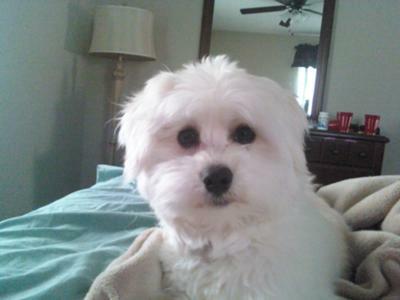 She's really cute and her personality sounds just like my Morkie, Muffit. They attach themselves, don't they? Muffit doesn't like to be far from me either, but is good when I have to leave. She doesn't have to be right in my lap, but is content being close by. Chloe is 3yr old Havamalt are family got her when she was year old got from a dog rescue she was very shy & skittish & afraid of everything. Chloe is very sweet loving little girl very playful loves to play with her brother loves toys dog clothes & blankets she is mostly happy when your holding her or she's on your lap she's the best and follows her mommy everywhere.